Commit to a recurrent day of the week, on a monthly basis. Call the client to let them know you are on your way and double check the address, before leaving the Pantry. Verify the groceries for each of your assigned clients, according to the menu order. Bring back to the pantry cold bags & Signed Menu with the Name of the Driver, Signature of the client and delivery date at the bottom of the Menu Order. With the support of Food Delivery Drivers we are able to provide food groceries to 500+ families within Broward County, on a monthly basis. The DBJG Cupboard is the largest kosher food pantry to help eliminate hunger in the Jewish community. 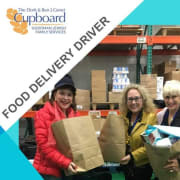 The Organization solicits, collects, provides and, whenever necessary, delivers food directly to, and in conjunction with, all the agencies in Broward that service this diverse population. Our whole-person approach starts with food provision through the distribution of nutritious kosher food. Approximately 4 hours per month.